A tough-on-crime street cop must protect the only surviving witness to a strange murderous cult with far-reaching plans. In 1985, Sylvester Stallone enjoyed a terrific year in commercial terms. With Rambo: First Blood Part II and Rocky IV, Stallone starred in the second and third highest-grossing flicks of that year. Stallone attempted to recapture this glory in 1986, but Cobra didn’t come close. Its $49 million plopped it in 15th place for the year, and it effectively marked the decline of Stallone’s career, as all his subsequent attempts to create gold from characters other than Rocky and Rambo failed to find much of an audience. None of this seemed apparent in 1986, though, and by the era’s standards, it did decently. However, I suspect most of its earnings came from the buzz Stallone generated in 1985. I know Cobra hit with a lot of hype in 1986 and I saw it back then, but I’ve not watched it since then. With this new Collector’s Edition in my grasp, I figured I’d give see how well – or poorly – the film aged over the last 33 years. 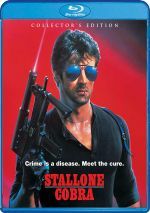 LAPD Lieutenant Marion “Cobra” Cobretti (Stallone) fights violent criminals in the most brutal way. Eventually this leads him toward an unusual opponent. Known as the “Night Slasher” (Brian Thompson), a cult leader executes random citizens across LA. A waitress named Ingrid (Brigitte Nielsen) becomes a surviving witness to these crimes, and that places her in the Slasher’s crosshairs, with only Cobra to protect her. People view 80s action films as a series of neo-fascist explorations of brutal semi-vigilante anti-heroes and cheap one-liners. This trend seemed to launch with 1983’s Sudden Impact, but I think 1985’s Rambo and Commando really became the template for the format. This means the classic “80s action flick” didn’t truly evolve until the decade’s second half, and Cobra follows the template to a “T”. For better or for worse, the film offers a virtually definitive example of the genre. And I’ll go “for worse”, as Cobra provides a laughable attempt at action and thrills. Man, did we take this nonsense seriously back in the day? Yeah, we did, but I can’t figure out why. I guess all eras come with crap that looks good in the day but ages poorly, and these muscle-bound action flicks from the 80s fit that bill. From the distance of 33 years later, it becomes impossible to view Cobra as anything other than unintentional comedy, though I admit I find it possible the filmmakers winked at the audience more than we realized in 1986. 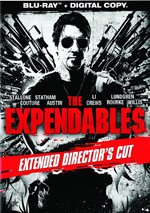 For one, Stallone seems too smart to produce such meat-headed cheese without some form of satirical edge. In addition, the film’s supporting cast may support this notion. David Rasche would soon play the lead on TV’s Sledge Hammer!, a series about a ridiculously violent cop, and Andrew Robinson’s main claim to fame remains his turn as the serial killer in the original Dirty Harry. Because Sledge Hammer! didn’t hit the air until four months after Cobra debuted, it seems possible that Rasche’s casting had nothing to do with his TV role. However, I can’t believe that Robinson ended up in Cobra as anything other than a knowing wink toward Dirty Harry. Since Reni Santoni plays Cobra’s partner and also worked in the same vein with Harry Callahan, this self-conscious nod toward the Eastwood film becomes even more probable. After all, Cobra himself acts as nothing more than a more muscle-bound version of Harry Callahan – and one without as much personality. While Harry offered a pretty one-dimensional right-wing fantasy, at least Clint Eastwood brought flinty power to the role. Stallone fails to do the same for Cobra, and the part seems oddly split. On one hand, the flick paints Cobra as the toughest of the tough, but on the other, it gives him a “sensitive guy” side that Callahan lacked. I guess I should appreciate the latter aspect of Cobra’s personality, but instead, his softer traits tend to feel like a mismatch. Stallone wants the violent fantasy and the thoughtful hero, but the two don’t mesh. For the most part, Cobra just seems like a douchebag. With his aviator glasses, vintage car replete with bragging personalized plate and omnipresent toothpick in his mouth, Cobra screams “I’m overcompensating!” He’s less an admirable man’s man and more a cartoon picture of someone who works hard to make up for deficiencies in his crotch area. Even if I try to ignore the movie’s odd mix of camp and fascism, it just doesn’t work. The film’s pace makes it slow and meandering, and the main villain lacks much to become compelling. It seems like the use of an insane serial killer becomes another nod toward Dirty Harry, but the Slasher fails to bring much real menace. We’ve gotten many compelling psychopaths in cinema over the decades, but the Slasher seems one-dimensional and silly. That goes for everything about Cobra, honestly. Even as a trip down memory lane back toward my teenaged years, the film lacks any form of real entertainment value. Cobra appears in an aspect ratio of approximately 1.85:1 on this Blu-ray Disc. Given the movie’s age and origins, this became a fairly good presentation. For the most part, sharpness worked fine. Some wider shots and interiors looked a little soft, but the majority of the movie appeared reasonably accurate and tight – this wasn’t a razor-sharp film but it seemed more than acceptable. Shimmering and jaggies remained absent, and I noticed no edge haloes. Print flaws also failed to mar the proceedings. Cobra featured a fairly subdued palette, and the colors looked adequate. I thought they could’ve been more vivid, but they were mostly good, and at least they usually lacked the murkiness that affects so many 1980s movies. Black levels seemed to be pretty dense and dark, and shadow detail was clean and natural. Nothing about the image excelled, but I thought the transfer offered a decent representation of an older flick. In addition, the DTS-HD MA 5.1 soundtrack of Cobra worked pretty well. The soundfield seemed oriented toward the forward channels, where they showed good stereo imaging for music and effects. Elements meshed together well and moved smoothly. Localization was also very good. The surrounds added more than acceptable reinforcement to the image. Audio quality was positive. Dialogue seemed slightly weak at times, as I occasionally heard some mild edginess, but it generally appeared warm and natural. Effects were fairly well-defined and full, though gunshots occasionally betrayed some distortion. Music sounded clean and lively, as the score was reproduced in a satisfying manner. This was an above-average mix for its era. This “Collector’s Edition” comes with an array of extras, and we start with an audio commentary from director George P. Cosmatos. He offers a running, screen-specific discussion of story/characters, sets and locations, music, editing, stunts and action, and related domains. Cosmatos’ commentary for Rambo remains one of the worst I’ve ever heard, but I hoped he’d do better for Cobra. He couldn’t possibly record another track as dull and pointless as his Rambo chat, could he? Nope. While not a great track by any stretch of the imagination, Cosmatos’ discussion works much better than his Rambo commentary. At times, Cosmatos does little more than describe the on-screen action, but this mars the commentary mainly in its early stages. Cosmatos warms up over time and eventually gets into enough of a groove to deliver a moderately informative track. Again, the piece fails to excel in any way, but it gives us enough substance to merit a listen. A few featurettes follow, and Stalking and Slashing fills 26 minutes. It presents notes from actor Brian Thompson, as he discusses his career and experiences during Cobra. Thompson gives us some good observations and insights, with the most interesting elements related to Cosmatos’s “tyrannical” attitude on the set. By the way, Cosmatos shows no animosity toward Thompson. While he doesn’t say much about the actor, the director nonetheless compliments Thompson a couple of times. With Meet the Disease, we find a 24-minute, five-second piece that brings info from actor Marco Rodriguez. Like Thompson, he covers aspects of his career and his time on the Cobra set. This becomes a reasonably engaging chat. Next comes Feel the Heat, a 14-minute, 15-second reel with actor Andrew Robinson. Ala the prior clips, Robinson talks about his time in movies and his work on Cobra. Robinson offers a blunt view of the film and makes this a lively piece. Double Crossed goes for nine minutes, five seconds and includes info from actor Lee Garlington. Once again, we get an overview of Garlington’s various experiences, and this turns into another good reel. After this we get A Work of Art. It runs eight minutes, 23 seconds and features actor Art La Fleur as he presents comments in the same vein as those from his co-stars. Expect another likable chat. From 1986, a Vintage Featurette spans seven minutes, 50 seconds and offers statements from Cosmatos, writer/actor Sylvester Stallone, stunt coordinator Terry Leonard, and actor Brigitte Nielsen. It acts as a pretty typical promotional affair, so don’t expect much from it. In addition to two trailers, we find two Still Galleries. The first focuses on “Photos” (51 images), while the second shows “Posters and Lobby Cards” (62). Both seem decent but no better than that. Eighties cheese of the most pungent variety, Cobra plays much more as parody than anything else. Unfortunately, it doesn’t offer compelling parody, so it becomes a silly, ridiculous action effort. The Blu-ray brings generally good picture and audio along with a pretty positive roster of supplements. Cobra fails to present any form of entertainment value.